Muttiah Muralitharan, well-known Sri Lankan cricketer who bears the world record for highest number of wickets in both versions of the game and recently retired from Test Cricket, said good-bye to One Day International Cricket (ODI) too after playing in the 10th World Cup Tournament concluded in the subcontinent in last April, where Sri Lankan team ended up as loosing finalist to the host country, India. The bowler claims 800 Test wickets and over 500 ODI wickets as well to his credit, an achievement that nobody ever succeeded in the history of cricket. In 2010, he announced the opening game of the three-match series also against India played in home country as his farewell game in Test Cricket and he finished it with bagging 08 scalps to complete 800-wicket mark. He also played First Class Cricket for Tamil Union (SL), Kent & Lancashire (UK) and Chennai Super Kings (India) during his career spanned almost twenty years. Making Test debut in 1992, 39-year-old Muralitharan’s massive bowling figures reads: 800 wickets in 133 matches including 67 time 5-wicket hauls in an inning (best: 9 for 51) and 22 time 10-wicket hauls in both innings (best: 16 for 230), at an average of 23.08 runs per wicket. His ODI record follows: 534 wickets in 350 matches with 10 time 5-wicket hauls (best: 7 for 30) averaging 22.72 at an economy rate of 3.93 runs per over. Even in the recently introduced Twenty20 version, he grabbed 13 wickets in 11 matches at 20.46 runs per wicket, an unbelievable average in the hard-hitter’s game. On his retirement, the Sri Lankan Government, sport officials and fans, business community and mass media hailed him as “Pride of Sri Lanka.” Newspaper headlines filled with wordings such as “Good Bye Rare National Hero!”, “Hats-Off to Murali!”, “Murali – a National Treasure”, etc. in both occasions. Electronic media too telecast various programmes, interviews, and video footages & clips of his previous milestones. Even days before, the entire country was decorated with huge farewell banners, cutouts, billboards, etc. The bowler has become major topic of the general public and local mass media, ignoring the burning issues that are prevailing in the country: economic crisis, war crimes, human rights violation, corruption, price hiking, etc. In a previous occasion too, when Muralitharan returned home from Zimbabwe after breaking West Indian Courtney Walsh’s bowling record, the Government and the Sri Lanka Cricket Institute jointly organized a hero’s welcome. The ruling coalition displayed a wall poster throughout the country saying, “Murali, you have made the country win. We too are.” President Chandrika Kumaratunga accorded a grand felicitation, awarding him a trophy and a cash reward. A road was named and a website was launched on behalf of him. Vouge Jewelers, A leading goldsmith, announced that they are making a Gold Cricket Ball for him. When Muralitharan surpassed Australian leg-spinner Shane Warne’s all time record of 708 Test wickets in 2007 again we saw similar situation: “Murali on the top of the world”, “Murali – spin king of the world”, “Murali, you are the world’s No. 1.” He was donated with a luxury car. Ministry of Posts & Telecommunication issued a commemorative stamp and a first-day cover to mark the event. The bowler was invited as a guest of honour to the parliament during the assembly for the first time in its history. However, sentiments are different and divided among cricketing world outside Sri Lanka debating the legitimacy of his bowling action, a controversy that erupted in his peak years and continued till the end. Whilst few cricketers and critics overseas praise the outgoing bowler, others kept silent or came forward to condemn him directly or indirectly. Muralitharan’s peculiar bowling action of right arm off-break style was questioned by some match officials and critics from time to time. Two Australian umpires, Darryl Hair and Ross Emerson, earlier called him for throwing the ball, which is illegal. The most notable thing was, umpire Hair no-balled him during the Boxing Day Test Match in Melbourne in 1995 even when the bowler delivered a leg-spin, which is, according to the experts including former Australian captain turned commentator Ian Chappell, not questionable at all! Incited by this, a considerable section of Australian spectators began to taunt Muralitharan as a ‘chucker’ and the majority of Sri Lankans considered this a national insult. The bowler was exonerated by the International Cricket Council (ICC) after bio-mechanic experts at the University of Western Australia scientifically proved that the bowler has inborn deformity in his arm with a double-hinged super flexible wrist, which creates an optical illusion of throwing. The assessment also revealed that the ball comes before his hand, just the opposite of a normal spinner, in a speed equaling that of a fast bowler. The speed generates not from straightening of the elbow but from an abnormal rotation of the shoulder-joint on its axis far more than most people can manage. Former England batsman Michael Atherton, a colleague of Muralitharan during his contracts with Lancashire County, said that he don’t consider the bowler as the greatest (as suggests by statistics), tagging his achievement of a “freakish brilliance.” Earlier, Barry Jarman, former Australian wicketkeeper, was quoted in the Sydney Daily Telegraph: “It makes the joke of the game. Everyone knows he bowls illegally.” Bishen Bedi, former Indian skipper, too wrote a series of degrading articles. While Jarman condemned the scientists who recommended the bowler, Bedi blamed the ICC for allowing him to bowl. Responses are “muted, hollow and under whelming” reported The Times. “I have been defamed, pilloried and severely criticized by the world’s sport media” the bowler himself expressed. Many critics pointed out that lingering doubts regarding Muralitharan’s bowling action have led to a less-than-comfortable recognition of his achievement and his world record will forever be tarnished by the endless debate over the issue. There are others with dubious actions but Muralitharan is often targeted because he grabs wickets (He had a strike rate of six wickets per Test). Everybody knows that sport is mostly spectator-oriented in this degenerated era. If a bowler captures wickets more frequently, the game is under threat of low scores and even of an early finish, which is a big blow to the commercial aspects of the game and that’s why the rule-makers are in the batsman’s side as never ever before. Muralitharan’s newly developed delivery, Doosra (the off-spinner’s leg-break), too has led to controversy. He was again subjected to screening. Tests carried out by means of synchronized high speed cameras operating at a minimum of 200 frames per second revealed Muralitharan straightens his arm more than the permitted limit when bowling the Doosra, thus outlawed by the ICC. However, scientist Bruce Elliot who led the testing urged that Muralitharan should be allowed to bowl the Doosra though he went beyond the tolerance level because he was not gaining any undue advantage by going up to 10 degrees flexion. It has now been accepted scientifically that the human eye cannot discern flexion below 15 degrees thus 99% of the bowlers throw under the stipulated laws! Perhaps Muralitharan was the most scrutinized of all cricketers. Once he had to demonstrate for Channel Four documentary with an inflexible arm brace weighing a distracting one pound fitted to the elbow in order to prove that he has the ability to turn the bowl even under physical restraint. The issue aroused a serious question: to what extent should the technology be involved in sport? The former Australian Prime Minister John Howard called Muralitharan a chucker soon after the latter broke Courtney Walsh’s record in 2004 (This selfsame Howard mouthed not a single word on Australian player Darrel Lehmann’s racial abuse against Muralitharan during his tenure). Howard, an ardent cricket fan and a conservative, voiced these unsound remarks in sight of Sri Lanka team’s tour of Australia whereas Muralitharan’s Australian rival, Shane Warne was just 10 wickets behind that of him, persuading Muralitharan to declare that he would boycott the tour. The newly elected Sri Lankan Prime Minister Mahinda Rajapakse, in turn, opened his big mouth too and announced that he is ready to sue the ICC for banning the Doosra. Dealing with this issue is beyond my scope. What I like to elaborate is the role of politicians, solely driven by the nationalistic perspectives. While Sri Lankan regime is trying to assemble the national consciousness, which has disintegrated amidst the racist war, the Australian ruling elite is seeking ways and means for cultivating a national ideology, which they lacked historically. Both parties are trying to give life to the nation state that is shrinking in the face of globalization of production. Finally, the ICC urged two Premiers to stay out of the matter and later gave the green light to the Doosra. Meanwhile, in a TV discussion, former Sri Lankan cricket captain turned politician who defended the bowler arguing with umpire Darryl Hair in the field, Arjuna Ranatunga, accused the Sri Lanka Cricket Board for exposing the bowler for screening, again revealing how far patriotic prejudices can travel. 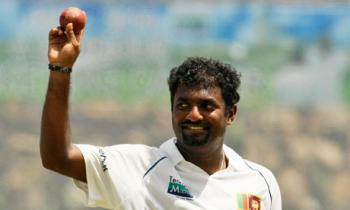 However, Kushil Gunasekera, Muralitharan’s manager, dismissed the opinion emphasizing the importance of screening. Indeed, Muttiah Muralitharan, a rare creation of the nature, was a valuable source for scientific research in human kinematics. Replying to a media person who asked what was the happiest day in his career Muralitharan didn’t come out with the expected answer – the day he set up the world record. Instead, he said, “it was the moment Sri Lanka team had won the Cricket World Cup in 1996.” Answering the next question, he described, again unexpectedly, (not the so-called Boxing Day but) the day Sinhala extremists torched his home during the infamous July pogrom in 1983 was the saddest of his life! And he went on to say more recently that “there’s no ethnic conflict in Sri Lanka and it was the politicians who have created all this.” Soon after the Asian tsunami disaster in 2004, Muralitharan, who volunteered rehabilitation work at his own expense, commented that the aid supplied by the government for the North & East provinces was not adequate. Roused by this statement, many Sinhala sport critics and journalists urged government to sack him from the national team irrespective of his importance. All those glorifications and vilifications are two sides of the same coin: nationalism and patriotism. It is clear that majority of the people including some famous personalities who are engaged in the debate even do not know exactly what a bowling action is! Nationalism and patriotism is not confined to Sri Lanka or Australia. Similar glorifications took place for West Indian batsman Brian Lara, who claimed twice the world record for highest batting score in an inning. When Lance Gibbs, West Indian spinner, overhauled Englishman Fred Trueman’s record in 1976, some Englishmen, including Trueman himself, muttered that Gibbs had bought over many of his victims! The “Gentlemen’s Game” is no longer stands for goodwill among nations but is a barrier to the unity of the international working class. Not only cricket but the whole spectra of sport are highly commercialized under the degenerated present-day capitalism and Muralitharan is only the latest bite. Cricket is now a multi-million dollar enterprise associated with gambling and similar trades. In this context, every player is a marketable product whereas each and every individual record goes as a value addition. It was reported that counterfeit Murali-autographed cricket balls were sold for ₤ 20 each. Apart from healthy financial remunerations and other benefits that are not made public, top-level cricketers, including Muralitharan, earn massive income from commercial advertising. Two local insurance giants, Janashakthi & Ceylinco, are now displaying huge Murali-appearing hoardings all over the country. Encouraging and highlighting individual performance is one of the socio-psychological aspects of the capitalist system, which is essential in promoting rivalry between each other, through competitiveness. Sri Lanka Telecom displaying a full-page newspaper advertisement these days saying “Murali, you make us believe that one man can make a difference.” This ideology, completely hostile to the progress of mankind, is misguiding younger generation who consider such sportsmen as idols. Muralitharan’s mentality had been imprisoned by local media in the task of going for 1000-wickets in Test Cricket, a milestone that is not easy to reach for years, at any cost. However, the bowler had some courage to declare that “I can’t say thousand wickets or whatever. If you don’t enjoy the game, it’ll be difficult” and eventually decided to retire at 800-wicket mark. It is only under classless society, in which commercial or nationalistic interests have nothing to do with sport, that people can really enjoy the game.